This 3322-foot peak stands on a ridge separating Little Dalton Canyon and San Gabriel Canyon just above Glendora. 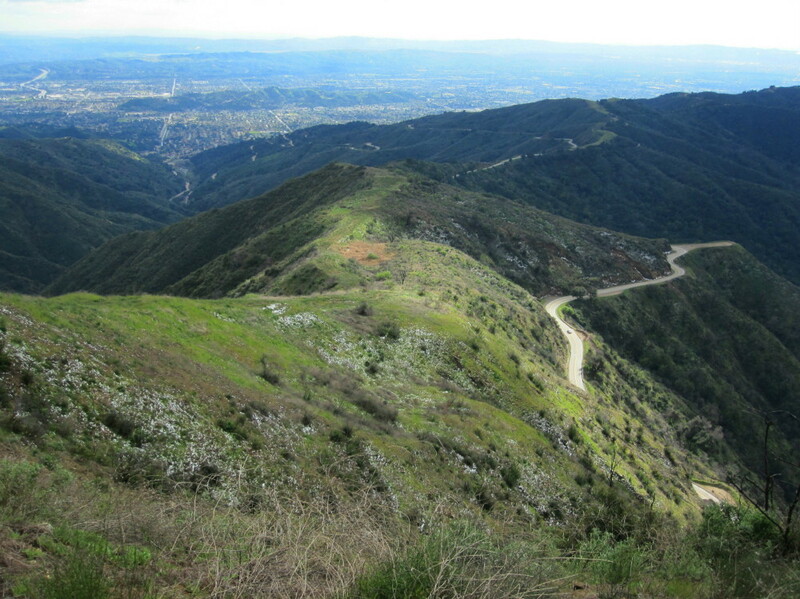 At only 2.0 miles round trip and 200 feet in net elevation gain, Glendora Mountain is easily accessible and makes a fun short hike offering splendid, unobstructed views of the surrounding mountains. In fact, it's the easiest named peak in this part of the range to reach. But note that the route is not a formal trail, but a network of use paths that follow a broad ridgeline. The peak does not get much foot traffic, so you may find some solitude on this short adventure, aside from the ever-present vehicle traffic on Glendora Mountain Road just down the slopes from your hike. 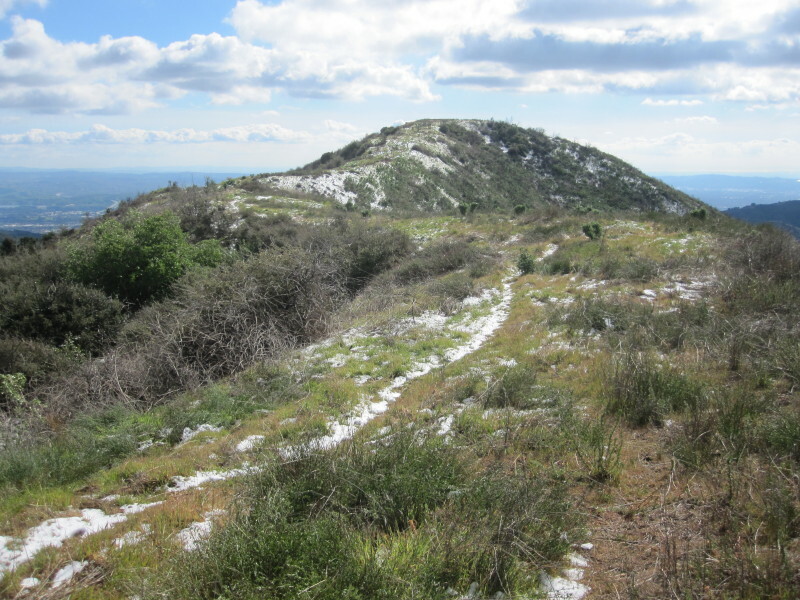 The best season to hike to Glendora Mountain is roughly November through May when the temps are pleasant and the hillsides green.The winter can offer delightful views of the glistening snow-capped high country. Spring is my favorite time, hosting the most wildflowers in bloom. Summer can be hot, so plan your trip in the early morning or late in the day. There is no shade at all on this trip. See Seasons of the San Gabriels for a detailed description of minding the seasons. 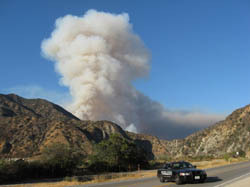 From the I-210 Freeway, exit Grand Avenue in Glendora. Go north on Grand 1.7 to Sierra Madre Blvd. and turn right (east). Drive 2.0 miles to Glendora Mountain Road (GMR) and turn left (if you cross the wash and dead-end at Valley Center, you have gone a block too far). 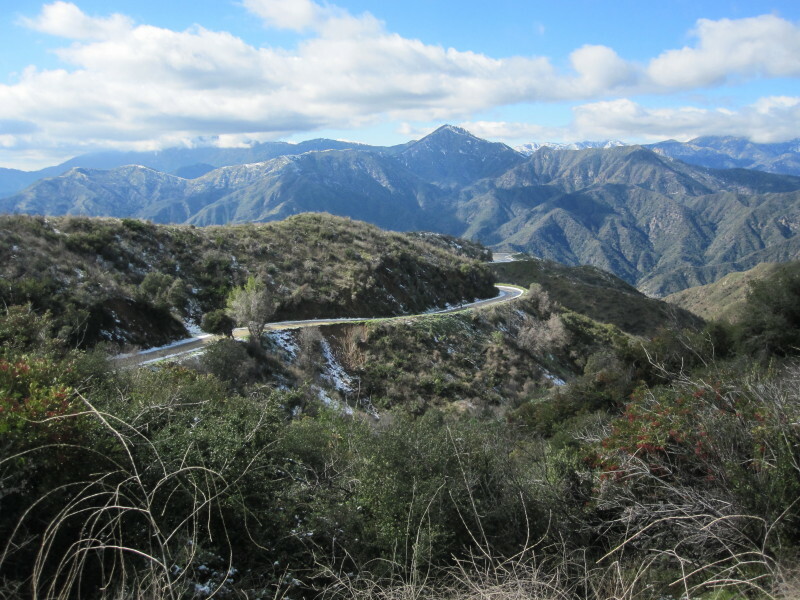 Drive north on GMR 8.2 miles to the narrow ridge dividing Little Dalton Canyon to the south and Persinger Canyon to the north (a tributary of San Gabriel Canyon), at mile marker 6.50. Park in the turnout on the south (right) side of the road, or drive another 75 yards to a larger turnout. A National Forest Adventure Pass is no longer needed since the rules have changed and passes are required only for parking in locations with guest amenities. From mile marker 6.50, begin climbing the firebreak west. It's a bit steep but not bad. Shortly you arrive at a knob (3311'), the first of about five bumps en route along this undulating ridge. The ridge bends to the south as a crescent. Soon San Gabriel Reservoir (to the northwest) comes into view in the canyon below. This entire portion of the mountains was incinerated by the Williams Fire of September 2002, which consumed 37,000 acres. But life gradually returned to be destroyed by again by the Morris Fire, which began on August 25, 2009 and burned more than 2,100 acres. It was stopped on this ridge from burning further east. After about 1.0 mile and a net gain of about 202 feet (554 feet of total gain counting the rollercoaster action), you arrive at the summit of Glendora Mountain (3322'). 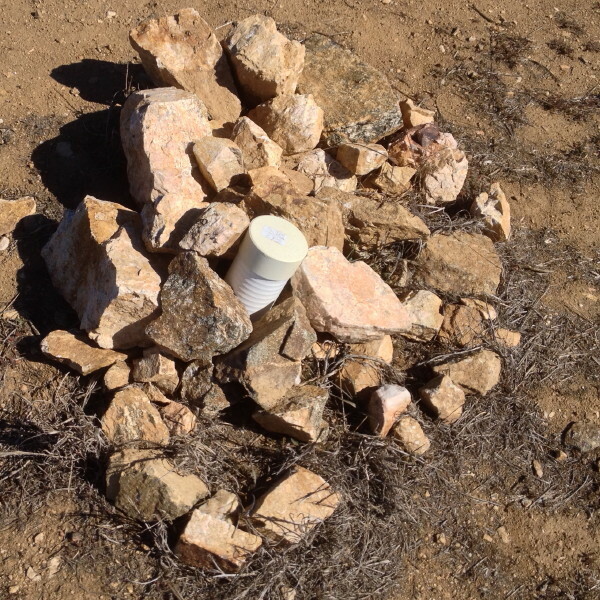 Secured in a pile of rocks, a PVC canister contains the summit log which you may sign. Enjoy the unobstructed 360-degree panorama (north / east). 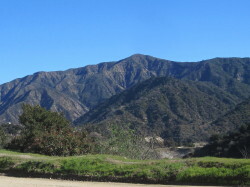 In San Gabriel Canyon to the southwest you see Morris Reservoir. On the slopes above it you see Summit 2843 and to the west Silver Mountain (3385') (see my hike description). The pointed peak to the northwest across the canyon is Pine Mountain (4539'). 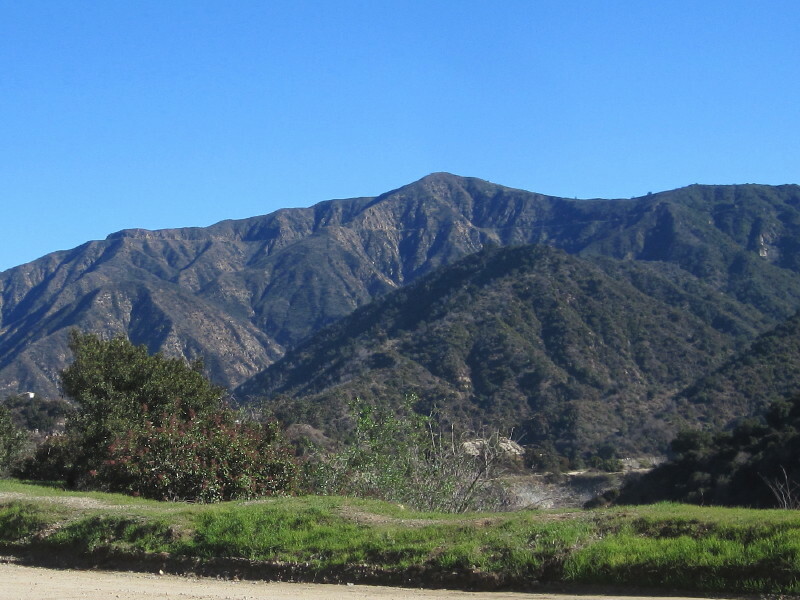 The northern panorama features the San Gabriel Mountains high country culminating with 10,064-foot Mt. Baldy in the east. Across Little Dalton Canyon to the east are summits 3368' (left) and 3397' (right), and southest, summit 2760'. 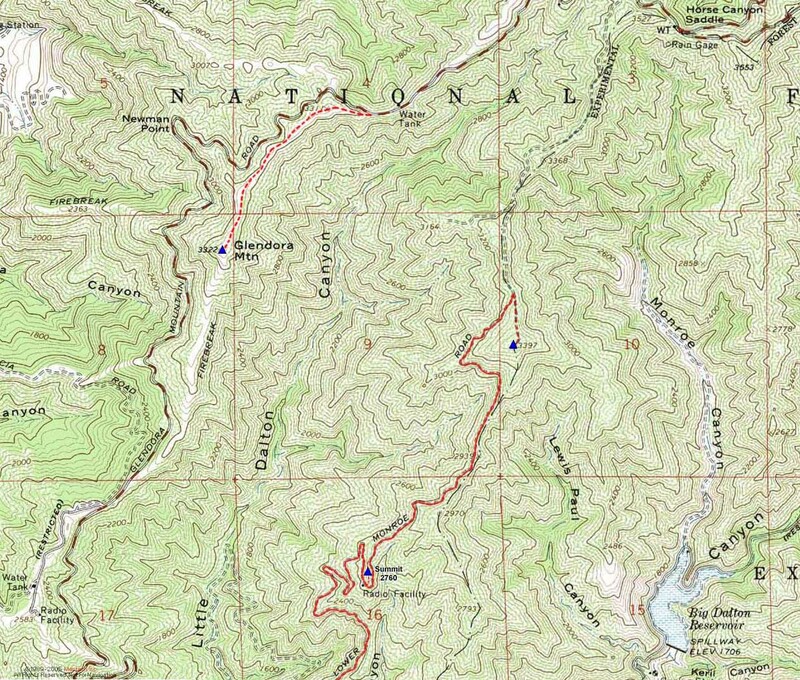 These unnamed peaks are accessible from Lower Monroe Road starting in Little Dalton Canyon or Big Dalton Canyon, or from GMR from the north (see my hike description). 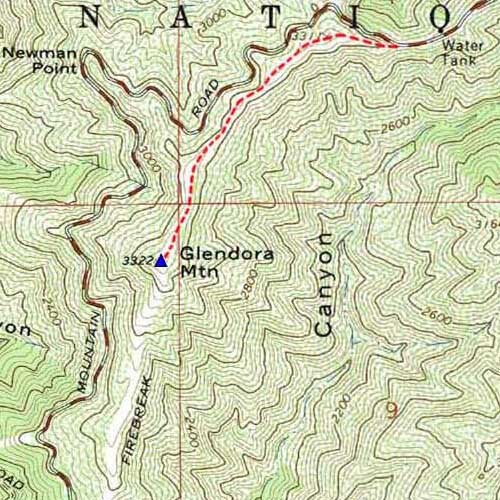 If you walk over to the southern edge of the summit, you can see GMR winding its way south to it starting point in the mouth of Little Dalton Canyon. On a clear day you can see the downtown L.A. skyline and all the way to Catalina Island. After enjoying your visit, return the way you came. Elevation Gain - There is a net gain of 202 vertical feet (TH 3120, peak 3322), but I estimate that the rollercoaster action along the ridge climbing over four high points totals 378 feet of gain to the summit and 176 gain on the return, thus a total gain of 554 vertical gain for the hike. Lower Peaks List - Glendora Mountain is on the Sierra Club Angeles Chapter Lower Peaks Committee List. They put the elevation gain at 800 feet, which I estimate is probably 246 feet too much. And they put the round trip at 3 miles, but it is actually only 2. This page was last updated November 15, 2015.